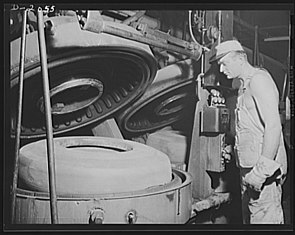 Worker placing tire in a mold before vulcanization. By far the most common vulcanizing methods depend on sulfur. Sulfur, by itself, is a slow vulcanizing agent and does not vulcanize synthetic polyolefins. Accelerated vulcanization is carried out using various compounds that modify the kinetics of crosslinking, this mixture is often referred to as a cure package. The main polymers subjected to sulfur vulcanization are polyisoprene (natural rubber) and styrene-butadiene rubber (SBR), which are used for most street-vehicle tires. The cure package is adjusted specifically for the substrate and the application. The reactive sites—cure sites—are allylic hydrogen atoms. These C-H bonds are adjacent to carbon-carbon double bonds. During vulcanization, some of these C-H bonds are replaced by chains of sulfur atoms that link with a cure site of another polymer chain. These bridges contain between one and several atoms. The number of sulfur atoms in the crosslink strongly influences the physical properties of the final rubber article. Short crosslinks give the rubber better heat resistance. Crosslinks with higher number of sulfur atoms give the rubber good dynamic properties but less heat resistance. Dynamic properties are important for flexing movements of the rubber article, e.g., the movement of a side-wall of a running tire. Without good flexing properties these movements rapidly form cracks, and ultimately make the rubber article fail. The vulcanization of neoprene or polychloroprene rubber (CR rubber) is carried out using metal oxides (specifically MgO and ZnO, sometimes PbO) rather than sulfur compounds which are presently used with many natural and synthetic rubbers. In addition, because of various processing factors (principally scorch, this being the premature cross-linking of rubbers due to the influence of heat), the choice of accelerator is governed by different rules to other diene rubbers. Most conventionally used accelerators are problematic when CR rubbers are cured and the most important accelerant has been found to be ethylene thiourea (ETU), which, although being an excellent and proven accelerator for polychloroprene, has been classified as reprotoxic. The European rubber industry has started a research project SafeRubber to develop a safer alternative to the use of ETU. RTV-1 (One-component systems); hardens due to the action of atmospheric humidity, a catalyst, and acetoxysilane. Acetoxysilane, when exposed to humid conditions, will form acetic acid. The curing process begins on the outer surface and progresses through to its core. The product is packed in airtight cartridges and is either in a fluid or paste form. RTV-1 silicone has good adhesion, elasticity, and durability characteristics. The Shore hardness can be varied between 18 and 60. Elongation at break can range from 150% up to 700%. They have excellent aging resistance due to superior resistance to UV radiation and weathering. RTV-2 (Two-component systems); two-component products that, when mixed, cure at room-temperature to a solid elastomer, a gel, or a flexible foam. RTV-2 remains flexible from −80 to 250 °C (−112 to 482 °F). Break-down occurs at temperatures above 350 °C (662 °F), leaving an inert silica deposit that is non-flammable and non-combustible. They can be used for electrical insulation due to their dielectric properties. Mechanical properties are satisfactory. RTV-2 is used to make flexible moulds, as well as many technical parts for industry and paramedical applications. ^ Akiba, M (1997). "Vulcanization and crosslinking in elastomers". Progress in Polymer Science. 22 (3): 475–521. doi:10.1016/S0079-6700(96)00015-9. ^ "MSDS for red RTV-Silicone" (PDF). Retrieved 24 June 2011.